Importance of NO has been nicely reviewed in the article “Discovery of NO and its effects of vascular biology”. Other articles which are good readings for the importance of NO are – a) regulation of glycolysis b) NO in cardiovascular disease c) NO and Immune responses Part I and Part II d) NO signaling pathways (Also, please see Source for more articles on NO and its significance). The rate of production of NO has been established to be dependent on Wall Shear Stress (WSS) (Mashour and Broock, Brain Res., 1999) . Many mathematical models have been developed as 2D diffusion models to predict distribution of NO transport in single vessels, eg. arterioles (Please see Sources for references ). Chen et. al. (Med. Biol. Eng. Comp., 2011) developed a 3-D model consisting of two branched arterioles and nine capillaries surrounding the vessels. Their model not only takes into account of the 3-D volume, but also branching effects on blood flow (Please see Fig 1 and Fig 2 from Chen et. al. 2011 ). The mathematical model considers dynamic characteristics related to blood flow, blood vessel structures and transport mechanism in the wall. The authors have considered effects of branching and ratio of diameters between blood vessels of parent and children to determine the fractional blood flow which gets distributed in the network. These branching effects of the vessels will also affect the blood volume or RBC (Red Blood Cell), hence NO consumption in the blood. Parameters in the model are either obtained or fitted with experimental results from literature. 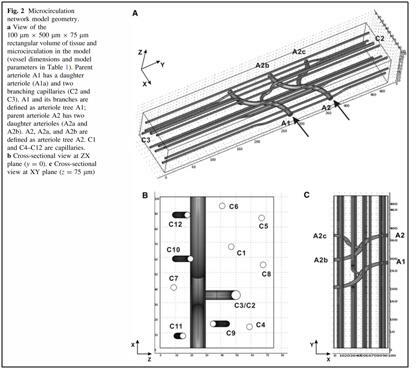 Their model assumes a linear relationship of NO production with wall shear stress which in turn will be regulated by blood flow determined by branching characteristics of blood vessels. Moreover, the mathematical model includes transport of NO through the blood vessels in the tissue (in the defined volume of the model) as diffusion model,. The model was solved using Finite Elements method using the software COMSOL. Their model results show that wall shear stress changes depending upon the distribution of RBC in the microcirculations of blood vessels, which leads to differential production of NO along the vascular network. Levels of NO at vascular walls can be less in branches which receive more blood flow, due to the balance between higher consumption of NO by RBC and production of NO due to high wall stress. Their 3-D simulations showed the importance of capillaries such that NO can be concentrated in tissues far away in distance from arterioles facilitating much controlled NO regulation. Though, the 3-D model developed by Chen et. al., (2011) is an idealized mathematical model of blood flow with production and consumption of NO, depending upon WSS, yet it shows importance of structure of blood vessels in distributions of NO in vessels and tissues. Such a model with proper extension to larger network can give more insights into differential distributions of NO as a function of blood flow and wall shear stress. As nano-medicine become sophisticated in years to come, information of distribution of NO in tissues and blood vessels can help the medicine to be more targeted. I added other NO related research – Vascular Biology is the domain of this post, thus I added the relevant posts, Aviral shall decide the relevance on the immune response and the distribution of NO. Anamika, Thanks for the informative post and I must say that the authors have made a brave attempt at predicting the quantified NO interactions in the vessels. I believe that the real boundary conditions are a huge challange to model, given the fact that the bioavailability of NO at any given time depends on so many complex and intricate factors such as wss, intracellular mileu, presence/absence of other redox molecules, enzyme vicinity…etc. Looking forward to more models on NO activities. Thanks for posting this. Thank you for Leadership on Nitric Oxide, can’t wait to review and bring to the Board the New potential Title for the Book and its Table of Contents, a creations by you and Larry in accordance.